The young generations started to adapt to social media early, but now also the older generations have found their way there: 55 percent of American adults over 50 are consuming news on social media sites, up from 45 percent in 2016. Of all adult Americans 67 percent rely on social media platforms such as Facebook, Twitter and Snapchat for news. The increase was five percent from year 2016. The decline comes mostly from Facebook, since its use as a news source has declined almost in every market. But it is also notable that Facebook has changed it’s algorithm to show less news and more personal and social content in users’ newsfeed. Digital News Report 2018 reveals that Facebook referrals to news sites have dropped significantly after the two major algorithm adjustments. Many of my interviewees were not too worried about, for example, social media’s power to cut them off from markets. One reason for not panicking with recent algorithmic changes in Facebook’s newsfeed is also due to the fact that the news media believes that social media need their content. They are also not that dependant on the platforms as a main source of traffic. Their readers find their brands without too much aggregation and they are already using their apps as news source. The Guardian’s Theresa Malone sees presence in social media being more [about?] marketing and building a brand. “We just did a big piece of work about what actually appeals to the underserved audience in particular, by which I mean younger, less-well-off, ethnic minorities, more women — and therefore those of us who are working in newer parts of the news sphere, like social media, we have a particular mission to try to appeal to them. That’s a lot to do with kind of topics you cover, and it’s about how you cover them. Another broadcaster, NBC News, has been successful with its attempts to attract more younger audience in Snapchat Discover. Their twice-a-day news show Stay Tuned gained audience of 4 million subscribers in five months after launch in August 2017. NBC News says that more than two-thirds of the subscribers are under the age of 25, and more than a half of them watched three or more episodes per week. The success tells that social media could be used effectively also as a news channel for video format news. The Washington Post says it is absolutely crucial to be present in new platforms, and his team of merging products also leads that co-operation with platforms. Director of that team, Chris Meighan, thinks that relationship with the platforms means that newsrooms are heard during the development. By collaborating with platforms they might have a say in the process. The Washington Post is one of the newsrooms co-operating with Google in AMP project. Other newsrooms working with Google in the project include the CNN, Conde Nast, Hearst, Mashable, Meredith, Mic and Vox Media. AMP is an abbreviation for ‘accelerated mobile pages’ and means quickly loading standard for mobile webpages. 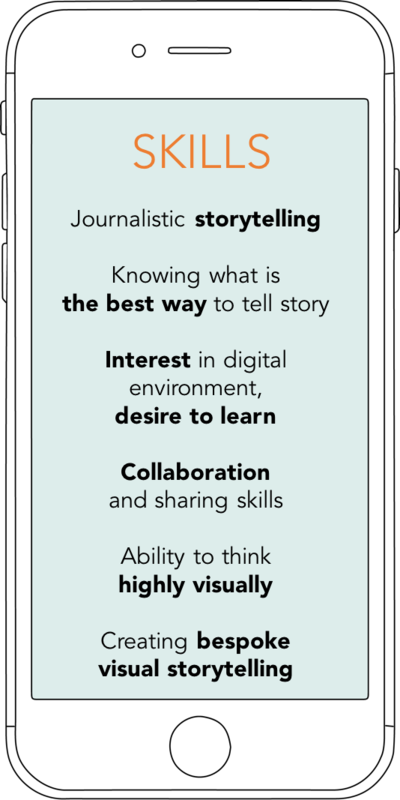 The company itself describes the stories as “mobile-focused format for delivering news and information as visually rich, tap-through stories”. Can trust be improved through design? Knowing your audience is crucial, but you cannot undermine the importance of audience knowing you. According to the Reuters Digital News Report 2018 (Newman et al. 2018), people access news more via side door routes like search, social media, email links or news aggregators than by landing to the site directly. The number of direct access was only 32 percent compared to 65 percent via other routes. For a public broadcaster, too, visual storytelling has enormous brand value. BBC’s Amanda Farnsworth believes that it has a positive effect on their already trusted brand. In a handbook for interactive data visualisation Ward, Grinstein and Keim (2010) note, that sight is our key sense for understanding information. They state that a picture is more powerful in delivering information than text “because image interpretation is performed in parallel within the human perceptual system, while the speed of text analysis is limited by the sequential process of reading”. Designers in media industrytypically do not differentiate content from design: if you don’t have anything to say, design can’t save it. Visual storytellers emphasize their role as journalists, as deliverers of the content. Daniels’ puzzle captures what is happening in the newsrooms at the moment. Visual people’s roles transform and overlap considerably, and when new tools and skills are introduced, a graphic designer is too simplified a title to describe what these people actually do. Amanda Farnsworth is the head of the multitalented BBC’s Digital Visual Team, which is a combination of a lot of different skillsets. 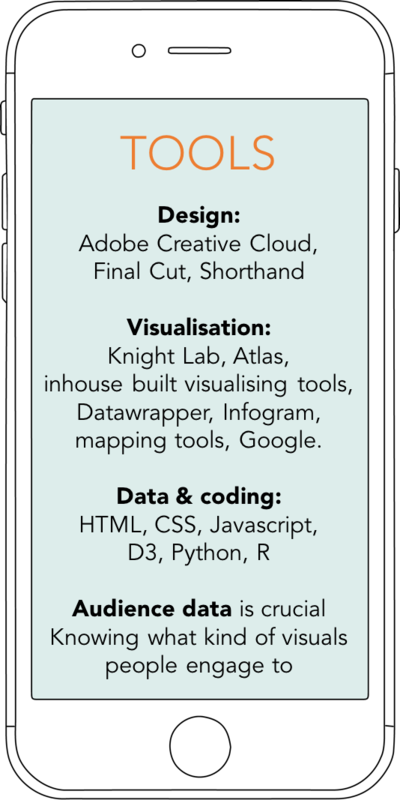 TV people already know their way in motion graphics, whereas people with data journalism background might be savvier with infographic visualisations. “One of the joys of the department having so many TV and digital people working together is that we share skills, we share information. People can go on attachment across platforms, and it’s worked very well. 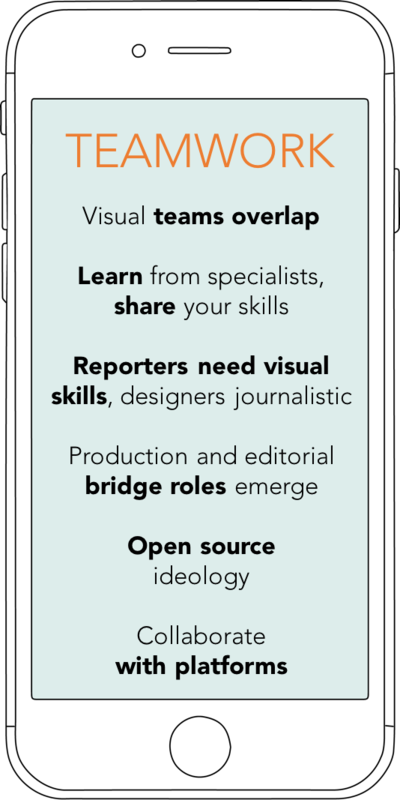 Digital journalism requires a lot co-operation also in-between designers and reporters. The collaboration should start as early as possible. The idea for a visual story can come from anyone: reporters or editors are no longer the only ones entitled to pitch a story. The Washington Post reporters have often noticed how successful a visual story can be, and Chris Meighan have seen the journalists come to the visual departments a lot more than before. People prefer to use their phone by scrolling the content, they also want to be in control of the storytelling, so anything that they didn’t wish to happen, they might find annoying. Swiping through vertical or card-like horizontal storytelling formats like Stories have got people accustomed to a continuous, linear storyform. Vertical is the word of mobile world. As audience turned more social they became more reluctant to turn their devise in a horizontal, landscape position, even when asked. Social pictures and videos started to be vertical, and when the world’s most popular video streaming service YouTube – with over billion users world-wide – allowed square and vertical videos in the end of 2017, the trend was starting to be the rule. 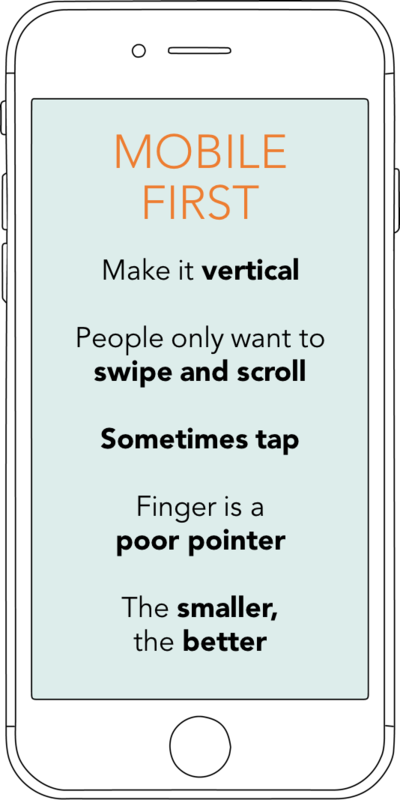 Vertical storytelling has also taught people that storytelling does not end in the first screen the reader sees, and people expect something to happen when they start to scroll. Chris Meighan has a rule for keeping people interested throughout the story. “We’ve put a lot of attention into the whole storyform, what we call down-page in the scroll. Because we try to get to the point where, if you’re scrolling out of mobile, every two scrolls you’re heading there’s some sort of visual in there, whether is a video, a quote, a photo or a graphic. There’s so much competition for people’s eyes, and once you get someone into the story, you really have to give more than just a cool animation at the top of the story. There needs to be a lot of attention to detail or you lose the readers. NBC’s senior graphic designer Nelson Hsu thinks that mastering coding is essential for a designer. 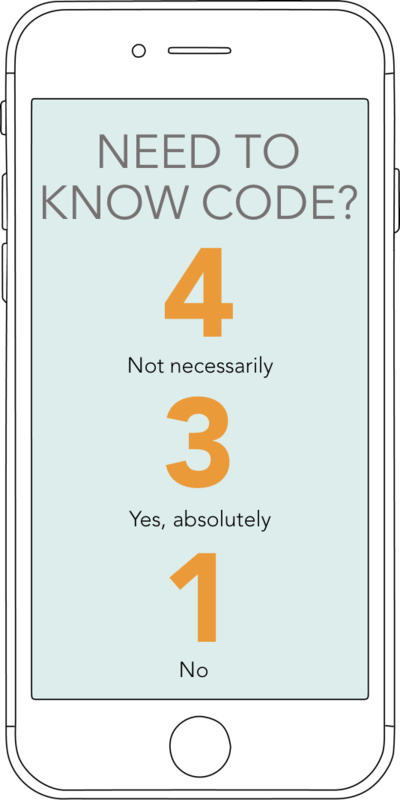 At the moment, the journalists and visualists in newsrooms try to understand the new narrative, but at the same time, anyone can upload an app to their smartphone, create their own story by dragging, dropping and tapping, with no coding experience. Where do you need a news designer, then? The form of the visual story has to suit the platform, has its character and brand and be easily consumed in different circumstances. To meet all the requirements of bespoke news sites is expensive and time consuming. Many news outlets have created their own tools and templates to make the processes quicker and more streamlined. Newsrooms started creating their own CMSs (content management systems) to be more flexible and not dependant on third party software suppliers with their publishing. The Guardian, The Times, Washington Post and New York Times have developed their own in-house CMSs. These systems enable fast publishing and also agile development. Inside CMS there are also tools for journalist to make their content richer on the go. Outside and often open-source and free-to-use tools have also helped newsrooms add more visual elements in their storytelling. The most used among the interviewed newsrooms were Northwestern University’s Knight Lab’s journalistic tools, Datawrapper and Infogram. One of the tools that requires no coding experience, but creates highly visual storytelling, is Shorthand, which has become a broadly used visualising software in newsrooms. Among the costumers of this Australian online based software are, for example, the BBC, Telegraph and Thompson Reuters Foundation.